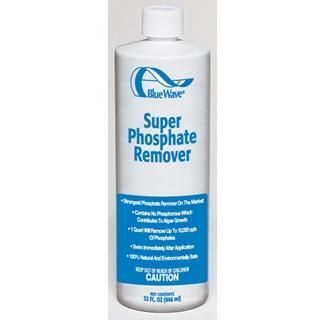 1 quart bottle of Super Phosphate Remover specialty pool chemical from Blue Wave®. FREE SHIPPING! Are phosphates feeding algae in your pool? Phosphates are vital plant nutrients but their presence in pool water, even at low levels, act as a food source for algae. Stop that frustrating algae growth with this environmentally safe, 100% natural phosphate remover. Only 5 ounces of this super-concentrated formula will treat 1500 parts per billion of phosphates in a 10,000 gallon pool. Phosphates come from a variety of sources. Municipal and rain water, fertilizers, plant debris, groundwater run-off, dirt/dust, and other pool chemical have all been blamed for increasing phosphate levels. Phosphates are also natural components of swimmer body fluids and waste. Do you have phosphates in your water? If you have a persistent problem with algae, it is likely that the algae are feeding off of the phosphate plant foods. Symptoms include cloudy water, slippery/slimy surfaces, excessive chemical consumption, and poor water quality. What is an acceptable level of phosphates? Some experts say that no level of phosphates in your pool is acceptable. Others say to treat pool water when phosphate levels reach 1000 ppb (or .1 ppm). The bottom line is that the more phosphates you have, the greater food source the algae will have. Why not just shock the pool water to kill the algae? Shocking the pool with high concentrations of chlorine will kill off most of the algae. However, shocking does nothing to lower the phosphate levels in your pool. Once the chlorine levels return to normal, the favorable conditions for algae growth will still be there and algae will start to redevelop. 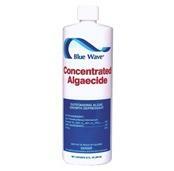 Only by removing the phosphates nutrients feeding the algae will you be able to stop algae growth. 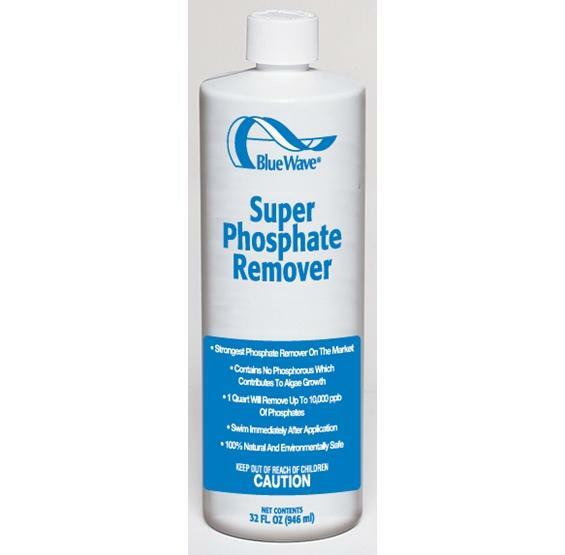 How does the Super Phosphate Remover work? 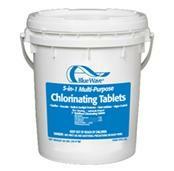 The highly concentrated solution bonds to the phosphates in your water. The bonded phosphates are then caught by your filter to prevent re-growth of algae. Test pool water for phosphate level with a phosphate test kit. Turn on the circulation system. Follow the dosage chart and slowly add required amount of this product evenly around the perimeter of the pool. Do not add more than 8 oz at one time. The phosphate fallout may increase your filter’s pressure. Clean or backwash your filter regularly. Note: this product may cause clouding of the pool water. This is a normal reaction caused by the product bonding with the phosphates. Your filtration system will remove the bonded phosphates from the pool water. Allow several hours for the water to clear.